UHD-TS is an easy to use and affordable Ultra HD compressed video playout server for professional broadcast or streaming applications such as for satellite, terrestrial, cable networks, or telco/IPTV operators and playout facilities. UHD-TS supports HEVC and AVC transport stream files, either in HD, full-HD or Ultra HD. Video and audio PID’s can be selected and remapped for SPTS over UDP or RTP multicast streaming. Secured by multiple HDD drives in RAID configuration, redundant power supplies and carrier-grade built quality, the UHD-TS can be used in any field or head-end situations either for UHD migration validation, or long test run, and even 24-7 broadcast playout with an optional scheduler and playout event automation. BBright’s advanced technology and field proven know-how enable the UHD-TS server to deliver uncompromised compressed playout reliability for the most demanding Ultra HD workflow and linear channel. 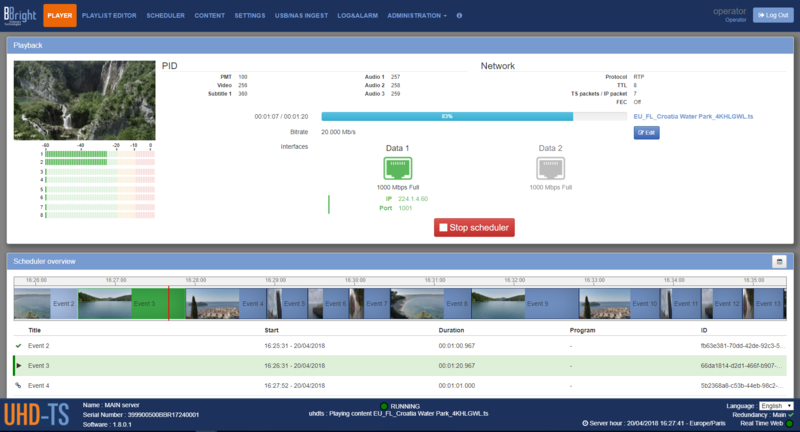 Playout event scheduler: manually via web-based GUI (or external playlist import).